Camera Tracking – Wildtrackers – The remote location specialists. Wildtrackers in a partnership with BATT, Barbour All Terrain Tracking Ltd, BATT Ltd runs its own specialist camera tracking vehicle. The BATT vehicle is specifically designed and modified to produce the best quality, high speed off-road action pictures. Wildtrackers and BATT can advise on all types of off-road film work. BATT Mk 2 tracking vehicle now in development…. 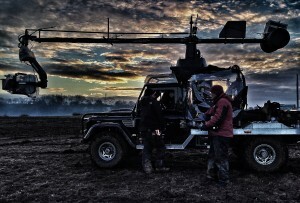 Barbour All-Terrain Tracking Ltd exploits a gap in the film industry for on and off road camera tracking using the same vehicle. The prototype vehicle BATT 1 also satisfies the requirement for high speed tracking and BATT Ltd has an impressive range of credits behind including two Oscar winning films. Breakthrough BATT 1 prototype vehicle for film and TV industry. (Allowing greater variety and speed of vehicle for shots in differing circumstances). BATT 2 under development in consultation with film industry utilising race and rally technology. Safety priority allows vehicle to operate as a secure filming platform on a variety of projects, whether it be conventional tracking work, stunts or special effects. Special projects are undertaken for specific filming requirements. BATT Ltd can also co-ordinate and advise on the preparation and use of action or support vehicles in film and television especially in an expedition or remote location role. Previous jobs have included working with the Model ‘A’ Fords in ‘TheEnglish Patient’, and teaching the lead actors driving skills on the film ‘The Avengers.’ (Not an unpleasant task where Uma Thurman was involved!). For any enquiries regarding camera tracking and BATT please click here for full more info.